A lot of water has passed under the proverbial bridge of life since then. Some of that "water" is my triumphant return to the night-shift (#BestKeptSecret). Working overnights has resulted in a few changes in our day to day routine(s). Since it's been nearly a decade since my last stint on the overnight shift, one obvious improvement is that the kids have done a lot of growing up. Three of the five are adults. The remaining two are at (or on the brink of) their teenage years. The kids are MUCH more independent. This year, the Mother of Five was working on the day before Easter. I was in the middle of my work-week (working overnights) so I spent most of the day asleep. When I finally awoke, I came out of the bedroom to make sure the house had not burned down around me, and to see what the kids have been up to while I was asleep. #4 of 5 and #5 of 5 were both eager to show off their accomplishment! They had dyed the Easter eggs! Not only had they dyed the eggs on their own, but they had continued the tradition of the "Barf Egg" - and were more than eager to show it off!! 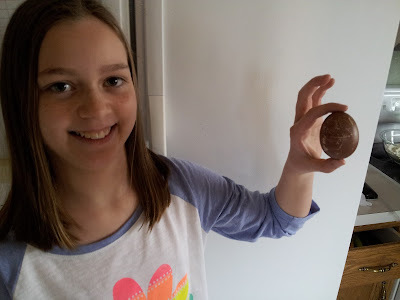 Here, you see #5 of 5 PROUDLY showing off this year's "Barf Egg"! 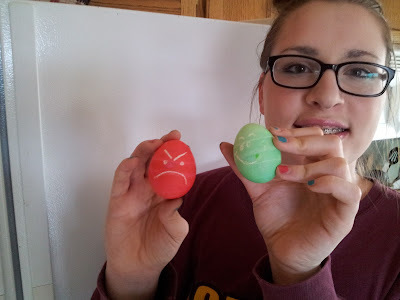 The "Barf Egg" was not alone this year! #4 of 5 debuted her "Angry Egg" and her "Happy Egg"
Well, it sure has been a great run. Way back, (if memory serves me correctly - circa 1986) I made a new friend. Actually, this “new friend” was actually a former co-worker. As co-workers, we primarily worked opposite weekday shifts, but we worked together on the weekends. I think it is safe to say that we got to know each other as “acquaintances”. Our stint of being “co-workers” was (relatively speaking) short lived. Eventually Ed followed other opportunities - but would still stop in to shop and say hello to his former co-workers from time to time. One fateful summer day he came to the store for some bicycle parts. I helped him find the parts while we made small talk. While we were catching up, he asked what I was doing for lunch. I thought it odd (and almost declined), but in the end I agreed to meet him after my shift for pizza. We had lunch, and my life was forever changed. If you have spent any time here on the blog you should recognize know him as “Best Bud Ed”. This is the story of how it all began. One of the things that happened after meeting Ed was that I learned how to play cribbage. I had never played, and Ed needed an opponent, so he taught me. Over the next several years whenever we hung out, we would often end up at his house at some point – and when we did, the deck of cards came out, and we would be “throwing down fifteens”. Over the next thirty years the frequency in which we played cribbage would (as they say) wax and wane – affected by things like proximity, availability, interest, weather, and more. Through it all, there has been one pretty consistent aspect of playing cribbage with Ed. A deck of cards. Not just any deck of cards. No. A deck of Remington cards. The cards depict a slough in what I always perceived to be the fall – during duck hunting season, with their slogan… “Remington, first in the field”. Last weekend, I made a trip to visit Ed (we live several hours apart nowadays). As you may suspect, during this visit we broke out the cribbage board and the deck of cards. As we played the first (of many) games that weekend, we both noted how much the cards have “yellowed” (with age) over the years. It was actually quite noticeable. About half way through that first game we had both also commented on how degraded the actual “structure” of the cards have become. The cards were actually kind of difficult to shuffle due to how broken down they have become. Finally, towards the end of the game, Ed made a suggestion (a suggestion that I agreed was due…) Ed suggested that the game we were currently playing may need to be the last for the infamous deck of Remington playing cards. He suggested (and I agreed) that the time had come to retire the cards from use. Yup… The deck of cards you see in this photo (staged and then taken while Ed was retrieving a new deck of cards) is the very same deck of cards Ed used to teach me how to play cribbage. It is the same deck we have spent COUNTLESS hours and a staggering number of games playing cribbage with. It is the same deck of cards that will forever be etched into my memories. Memories of good times, with a great friend. This deck of cards has earned its well-deserved retirement.